Americans tend to have a way of drinking unlike people in other parts of the world. Whereas in many countries people can easily have a drink with lunch and a drink with dinner and be good, many Americans like to drink for other reasons (ie. to get drunk). Case in point: shandy-style beers. 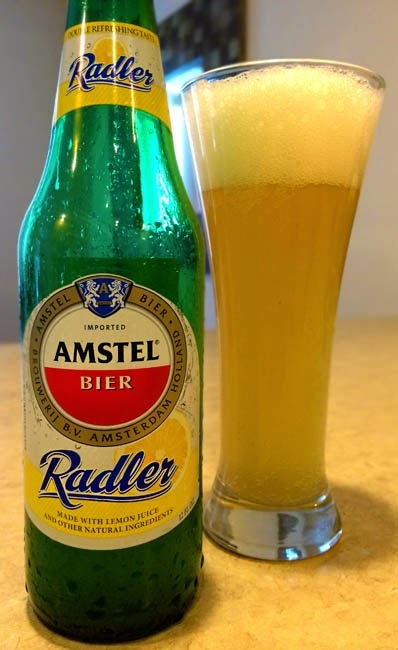 Today's review beer, Amstel Radler, is a new shandy-style fruit beer. Shandy beers tend to be beer mixed with something else for flavoring, subsequently getting the alcohol content quite low. How un-American. To understand this, you have to understand the concept of drinking something purely for refreshment and taste. How European of me. And I'm quite alright with this idea. Cold lemonade on a hot day is amazing. Amstel Radler comes in at a low 2.0% which is fine because this isn't about getting a buzz, this is about refreshment and taste. It pours a slightly hazy subdued yellow hay color with a fizzy head not unlike carbonated soda. It smells like Lemon Head candy, but more mellow: sweet, candied lemon. Tasting brings light, soft lemon flavors that aren't cloyingly sweet or sour at all, and a delicate maltiness in the finish. Drink This: if you want something clean, refreshing and not too sweet that can be had anytime of day. Don't Drink This: if you're looking for a regular strength beer and/or strong, bold flavors.